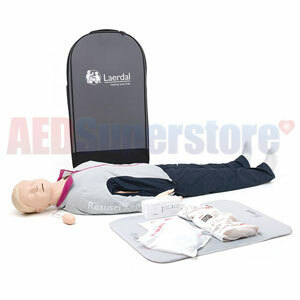 Resusci Anne First Aid Full Body with Hard Carry Case by Laerdal Medical. For realism in adult CPR and First Aid training, the modular construction allows students to sharpen their trauma treatment skills. Adding the First Aid or Rescue limbs brings a more true-to-life experience to any training exercise. Realistic anatomy and landmarks give the Resusci Anne Full Body the features essential for learning actual patient handling and first aid skills on an adult subject. Quality construction allows for training exercises in a various environments. The manikin can be fitted with a variety of limbs for more realism. Disposable airways and easily maintained faces keep things sanitary and cost-efficient. Features include a natural obstruction of the airway for learning airway opening maneuvers, like head tilt/chin lift and jaw thrust. There is resistance in the chest for realism in performing compressions. A carotid pulse can be simulated, and the anatomy allows for practicing identification of landmarks. Disposable non-rebreathing airways can be used by multiple students during class, and are easily changed after training. Removable/reusable faces allows for each student to have their own mouth-to-mouth face and can be easily cleaned after class. Includes full body manikin, 3 decorated faces, 2 airways, trolley suitcase/mat, jacket & pants, 50 maniking wipes, user guide.